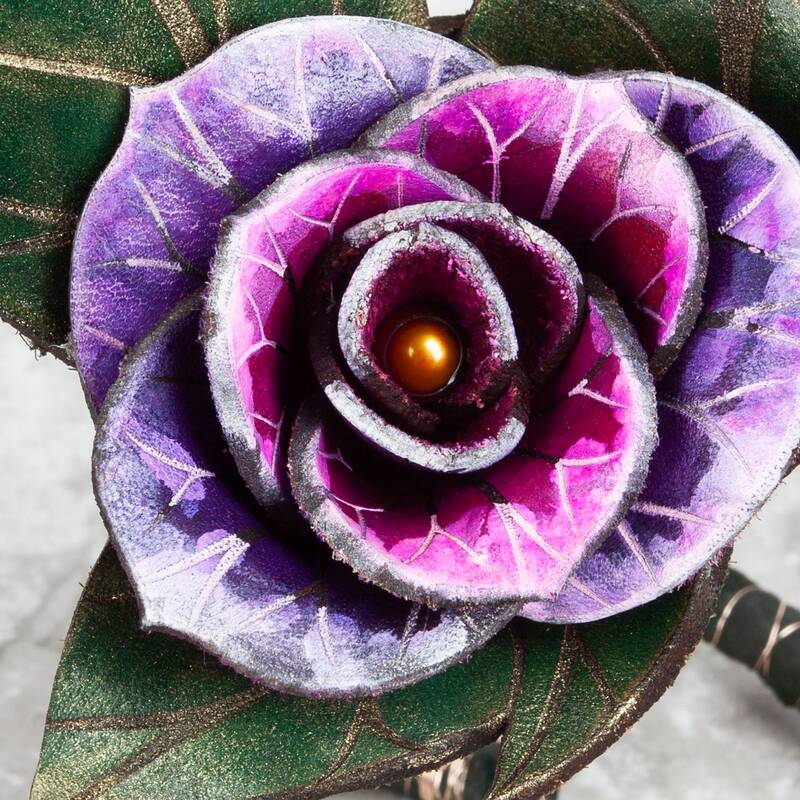 12 Gorgeous Handmade Leather Roses to last a lifetime! A beautiful way to show your love on that special anniversary. These bouquets make stunning Wedding Decorations for your Wedding Tables or as the Special Wedding Bouquet that the bride tosses! Our individual Roses sell for $95 a piece, so we've offered a nice discount for purchasing 1 Dozen. 1 dozen Roses can be completed and shipped within 1-2 weeks time. If you need them faster than that reach out before purchasing to see if we can accommodate your request. If ordering multiple bouquets please add a week of processing time per bouquet ordered. If you are ordering a large quantity (10-25) we recommend ordering 6 months in advance of your special day!! I am obsessed with all things Rose. I love the scent, I love the gorgeous variety of colors real Roses come in and adding Rosewater to chocolate can literally turn me into a puddle of bliss. 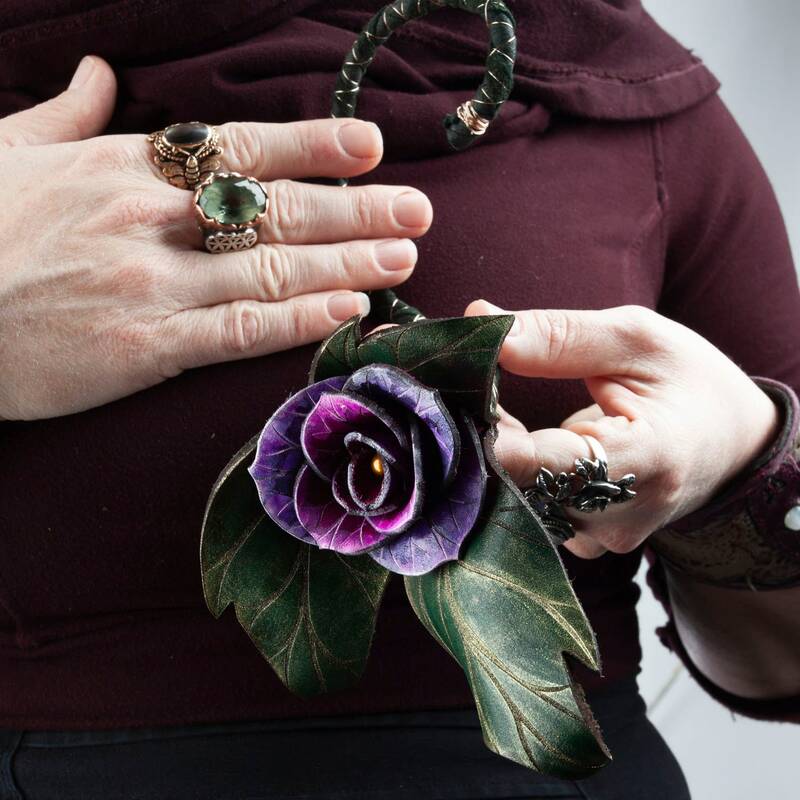 So when a customer asked me to custom make some leather Roses I was happy to oblige, honestly it has been on my *must make* list for years, seeing as how it is one of my favorite flowers. 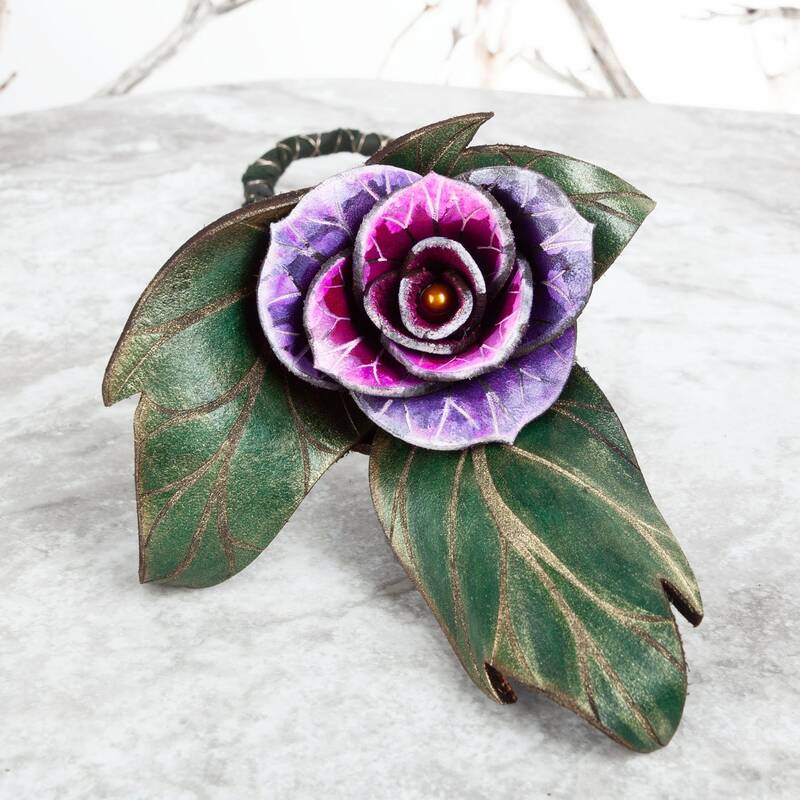 I especially adore how each leather Rose is so unique-no two are exactly alike, just like in nature! At Checkout select up to 2 main colors (one solid color is also just fine!) and in a message let me know if you would like a metallic accent on your Rose in either Gold, Silver, Copper or Pearlescent White or NO ACCENT. The leaves automatically have a metallic gold accent unless otherwise requested. Stems are wrapped in dark green leather, unless you request otherwise, simply message me for other stem color options. Real Freshwater Pearls come in a Copper/Rose Gold color. Alternately, I also have Amethyst, Tiger's Eye and Lapis Lazuli Beads available in place if the Freshwater Pearl Beads. If you want a colorful Rainbow Bouquet with each Rose in a different color please simply state Rainbow at Checkout. If you would like color swatches, I am happy to send you those after you place your order. Our Roses are hand-sculpted, hand-painted and sealed to ensure a long lasting fade resistant color. 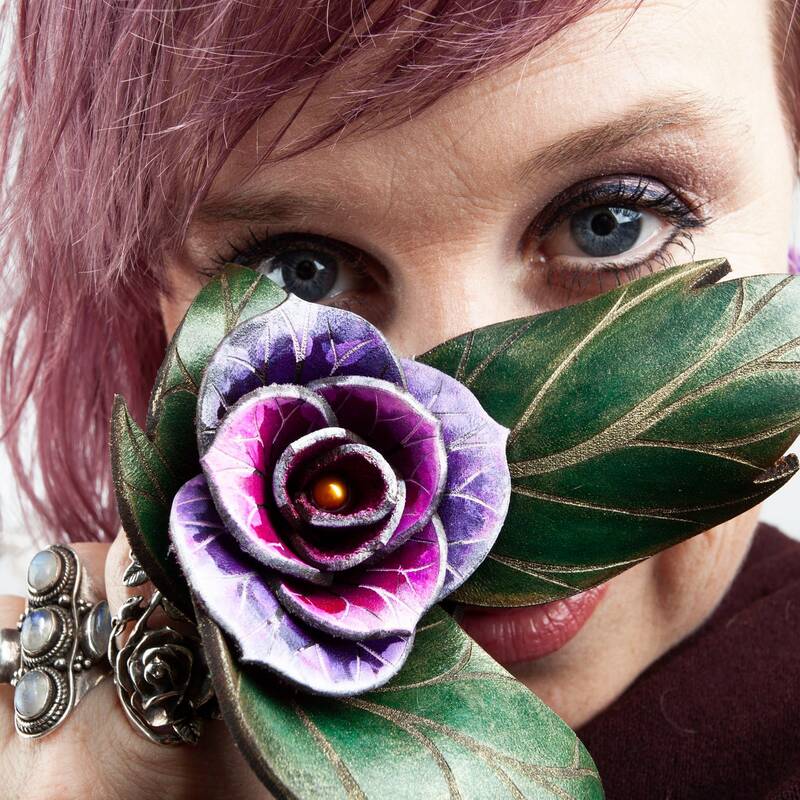 Each Rose is engraved with the veins and lines you see on the leaves and petals of real Roses making them realistic looking. 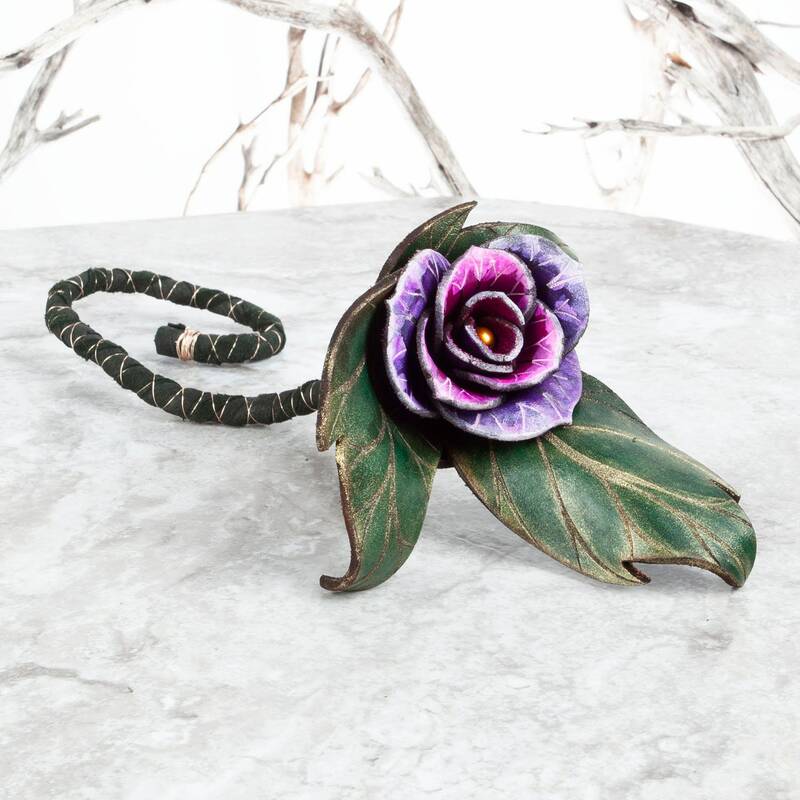 Our leather Roses are life size and in full bloom with a fresh water pearl at the center of each flower (see more bead options above). The Rose itself is about 2.5-3"tall by 2.5" wide and the leaves add another 3.5" in width. 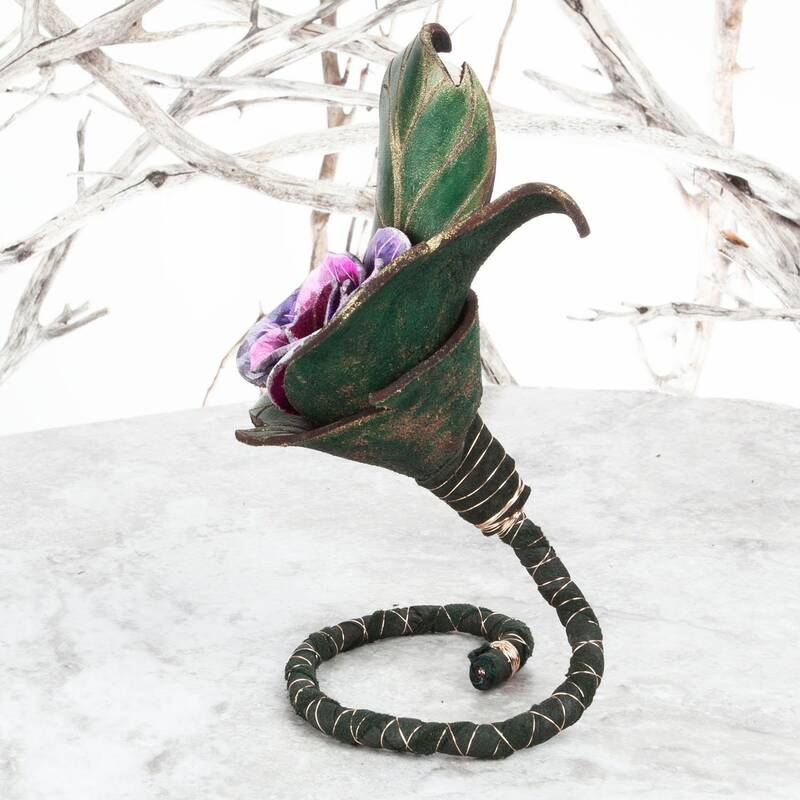 They have a long stem made from a flexible copper wire that has been ingeniously wrapped in a dark green leather. 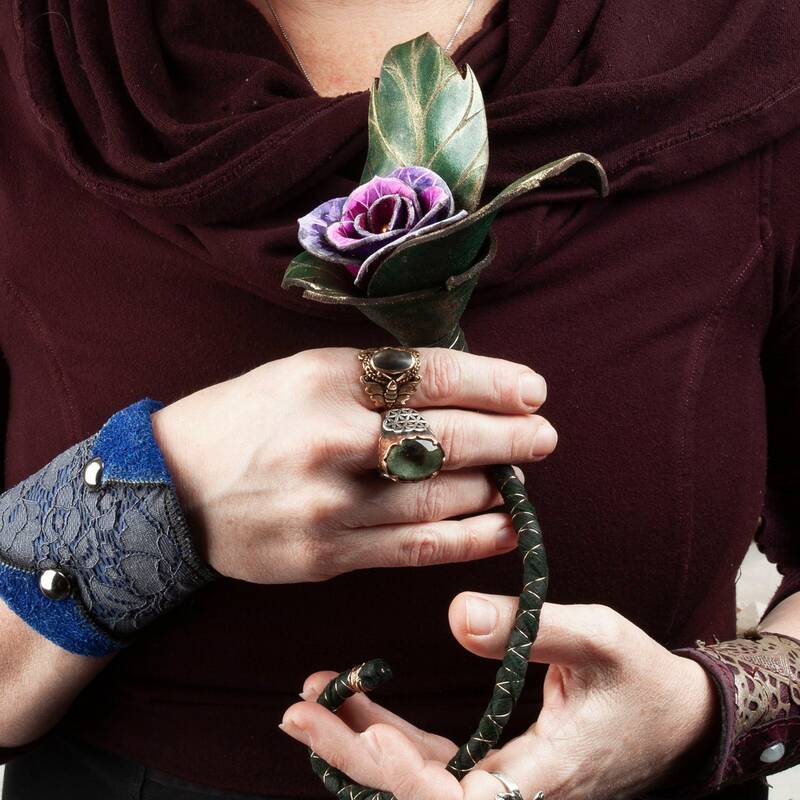 The flexible copper wire stem allows you to twist the stem into a spiral or shape it to wrap around the crown of your favorite hat. 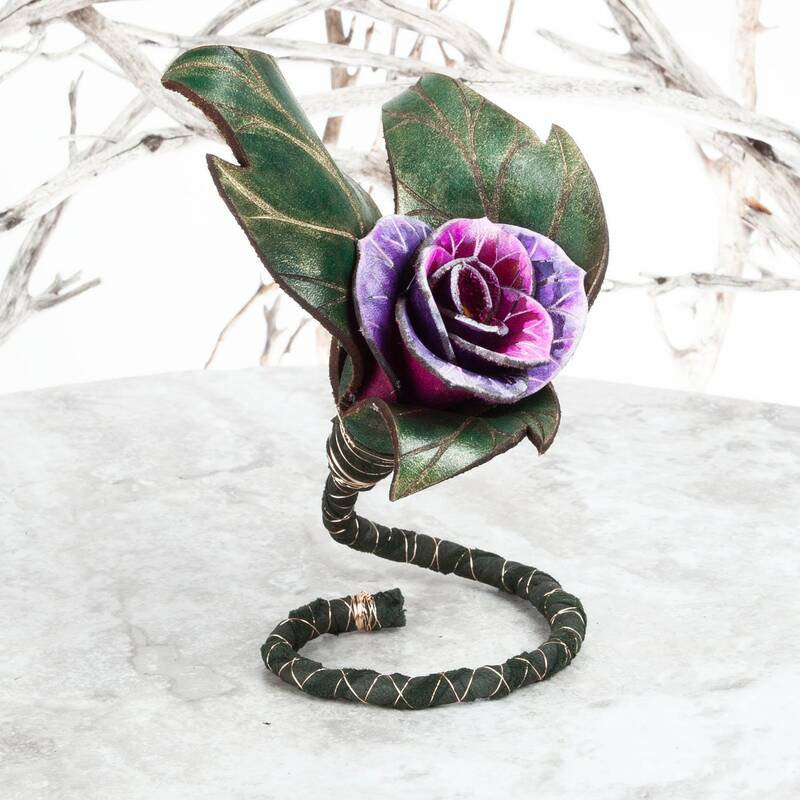 For added detail a thin copper wire covers the stem making these leather roses a true piece of decorative art. 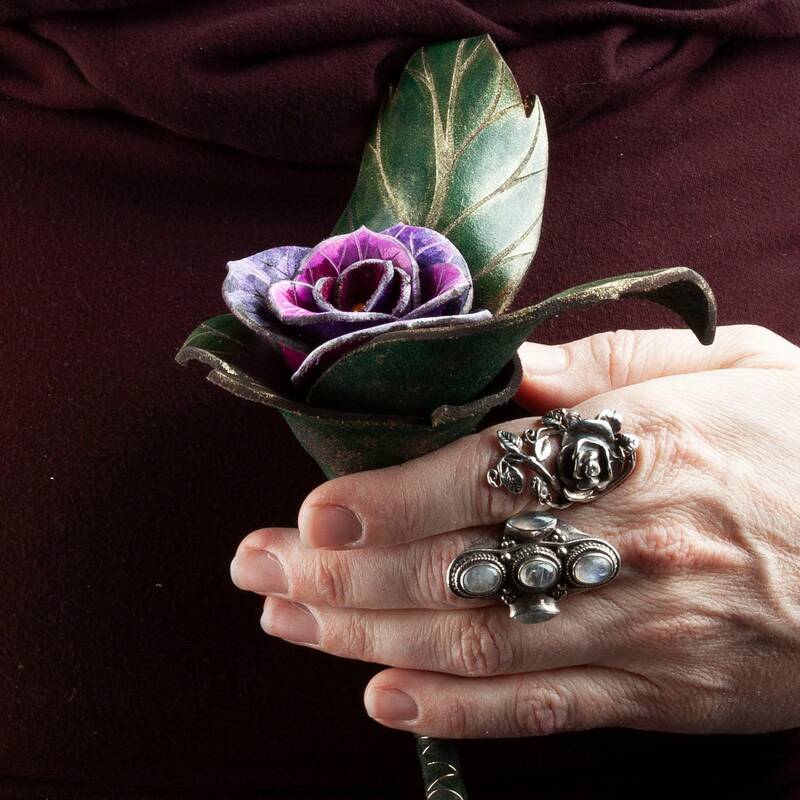 To finish these Roses a few drops of Rose essential oil is dropped into the center of the flower creating a most delicious leather rose scent. The stem itself is 16" in length and with flower is approximately 19" long. Length can be modified by request. These beauties are a wonderful way to express your love and make the perfect gift for a special anniversary, marriage proposal or a special surprise. 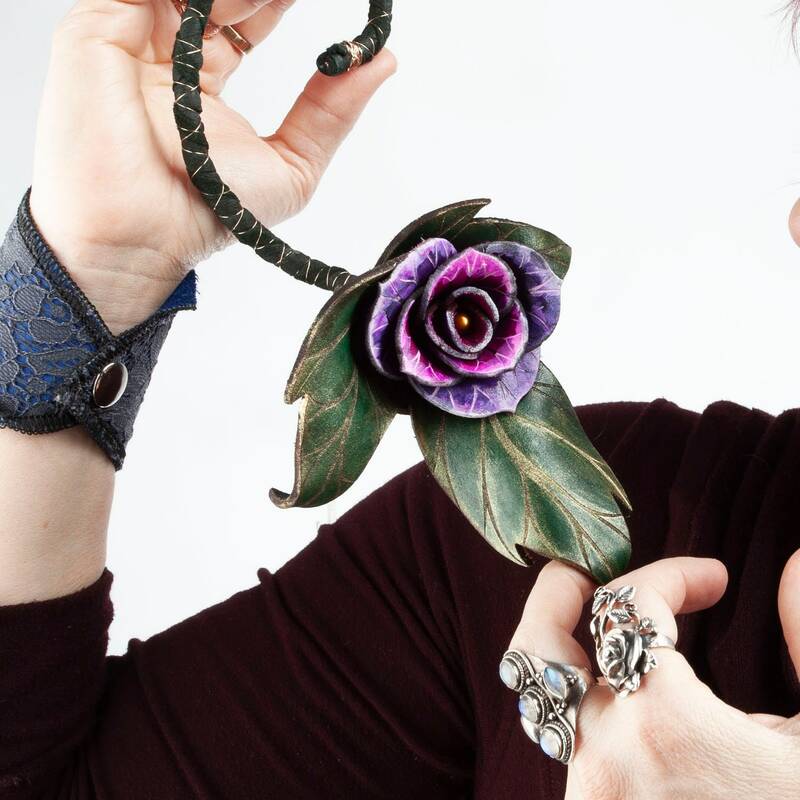 Our leather Roses are made from Veg Tan Leather that we cut, engrave, wet shape, hand-sculpt and paint to absolute perfection. Meant to last a lifetime, these Roses will pass on from one generation to the next.